I sometimes get overloaded with hotkeys for various apps. A common problem I have is discovering why a particular key combo works or collides. Is there an easy way to lookup which heyboard shortcuts are bound to which IDE actions? Currently I drill into the keymapping preferences and attempt to assign a mapping to an arbitrary action just so I can see if there is a conflict. I'd like the "Enter Keyboard Shortcut" dialog to be more of a general purpose tool for finding conflicts before hand. For instance, this morning I attempted to assign a "Maximize Window" shortcut in my OS X preferences using "Ctrl+Alt+Cmd+M" as the shortcut. It worked in all windows except for IntelliJ. I had to drill into the keymap preferences, and find an arbitrary action to assign a shortcut to just to discover if there were any conflicts. (I still don't understand why it fails in IntelliJ since there were no reported conflicts.) I would like to have access to the keyboard lookup dialog in a more general purpose fashion. Is there such a plugin or feature available? What do others think? 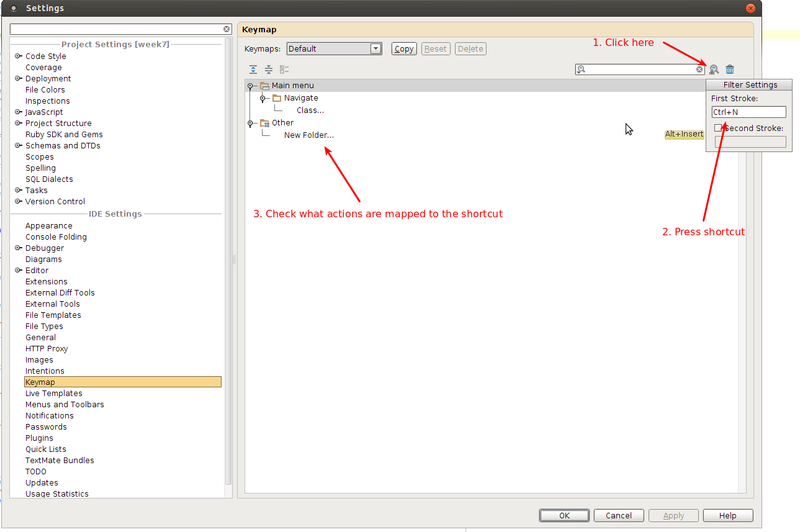 The only ability is to use 'find action by shortcut' control (see below). I'm not aware of any other built-in or existing functionality that provides more support there. My question is similar, but involves doing such a search in the Keymap settings. Is it possible to use the "Find Action by Shortcut" without the mouse? The point of a good keymap is to use the mouse as little as possible. I can't figuer out a way to activate this button via the keyboard. I don't expect every button in a UI to have a defined keyboard short, but I can't even use TAB to cycle to it like I can with the other buttons. The Key Promoter plugin doesn't provide a shortcut for it. Though related to the request above, I am asking more for some way to search for an action by typing something like "f2" or "ctrl+p" into the text filter to see what those keys are bound to. Searching for the enter key using "Find Action by Shortcut"shows six bindings, but the text enter shows only the two that have "enter" in the description. I've tried things like "<enter>" to no effect. I'm asking for clarification or confirmation of Denis's response that there is there a way to perform such a sealch without using the mouse and actually pressing the key in question.